Some items are available free of charge to all or registered site visitors, some are free for registered teachers only. Registration is free. We may request validation of your email address. Included in our free materials are recorded presentations, articles and papers and mystrategy demonstration materials. These are available under the tabs above. Registered teachers also have access to some additional material. These materials may be used for training or teaching others. These resources give a very quick experience of what "AgileSD" is (an agile approach to building Living Business Models fast and reliably), using a real-world case of an aggressive competitive threat to a product in a pharmaceuticals market. 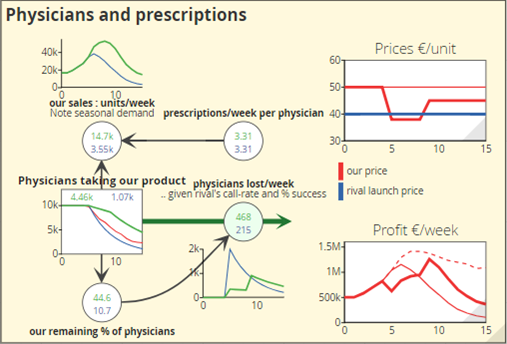 They consist of a YouTube playlist, (4 videos), explaining a pharmaceuticals competition case, the AgileSD principles and a demo of the simple case models. The slide decks are shown below, with download links. Learn more about Living Business Models (what they are, and why we need them). Take the free sample course on how to build a working model. Simulating business situations was, until recently, complicated, slow and costly - and the end-result could be disappointing. But recent advances in both method and tools have transformed this situation - building working, quantified business models is now easier, faster, cheaper and more reliable than trying to do the same thing with a spreadsheet. 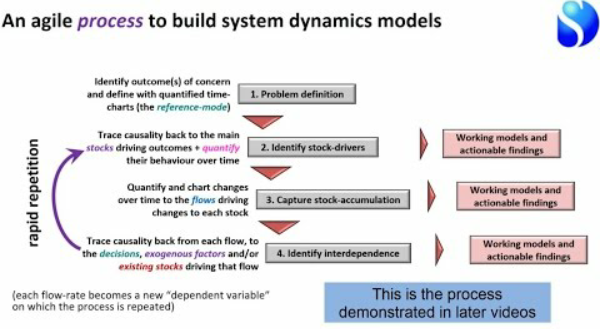 (See From spreadsheets to models: Making system dynamics mainstream Video, 22min). The videos making up this mini-course were recorded in a half-day workshop led by Kim Warren, and have been edited into a series of clips, in 3 parts. 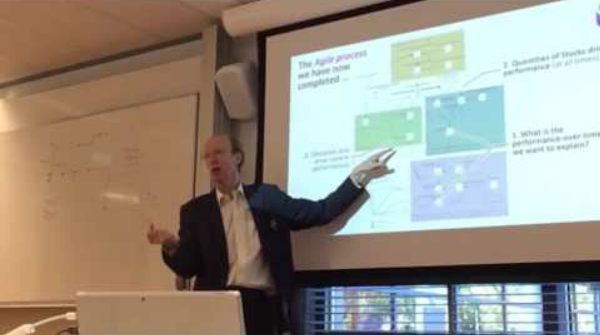 They explain and demonstrate an "Agile" approach to System Dynamics, in which very simple working models are built quickly with users, before adding more and more elements to build up a rich model of the situation. The class uses the Sysdea software - designed to be as easy-as-possible to use. However it is possible to follow most of the Agile method's principles while using other system dynamics software. All registered users may subscribe to our FREE email series. Delivered every 14 days direct to your inbox these briefings are drawn from the textbook Strategic Management Dynamics and include comments from Kim Warren on the application of the approach. To subscribe, select the SMD Briefing in my account. I just wanted to let everyone at Strategy Dynamics know that I love receiving these e-mails. As a Graduate student pursuing my M.S. Leadership, I find Strategy Dynamics very helpful; as the Ken Blanchard College of Business at Grand Canyon University expects MSL students to thoroughly understand strategy. Melissa Grant, B.A. Psychology, M.S. Leadership-2011. ...thank you again for your newsletter. Your Strategy page / your strategy newsletter is one of the best on the world wide web ! You meet EXACTLY what strategy is all about (many others don't ... ). If you would like to comment we would be pleased to hear from you. Use our contact form or reply to briefing emails. Want to learn how to build models for yourself? Kim Warren talks to Rod Brown, CEO of Opun.co.uk about how Living Business Models helped him test, finance and manage his business. Huge numbers of business analysts and others struggle to tackle time-based issues with spreadsheets, while it is easier, faster and cheaper to build living business models. Such models are much more useful, and far less prone to error (it is estimated that up to 90% of enterprise spreadsheets have fundamental, costly errors!). This video shows how these models are quite do-able by non-experts, with a simple early-stage business case. 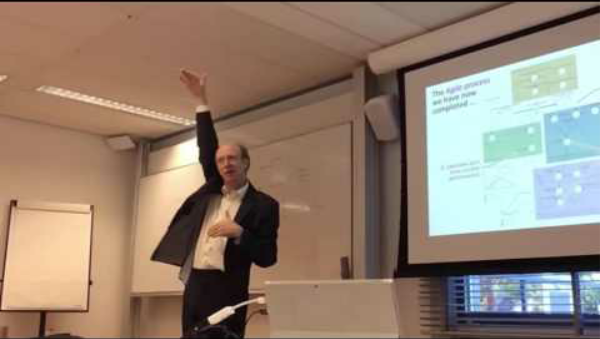 Recorded live at the International System Dynamics Conference in Delft, July 2016. Simulating business performance was once difficult, technical and costly - no longer. Following the rigorous principles outlined in Engineering the Enterprise with Living Business models and using latest software makes accurate, quantified, dynamic business models easier, faster and cheaper than spreadsheet models that are far less useful. KPIs and balanced scorecards automatically fall out of these models, and they can be used for continuous operational management as well as long-term strategy. Keynote presentation to KPI Institute conference in KL, 2016. Why do I need Dynamics? There are already many strategy methods and frameworks in our courses and textbooks, but they share some important limitations that are of real, practical importance. This short video outlines some of this issues. This refereed paper explains the need for a more 'agile' approach to building system dynamics simulation models, and describes both the principles and the practical process for doing so. The process has been widely applied, and has proved to be fast and reliable - the emerging model matches observed real-world behaviour at all times. The method is also highly teachable, enabling students and other new-comers to business simulation to create useful models quickly. This "agileSD" process underpins all of our learning materials, especially the online business modeling classes. System dynamics modeling deals with real-world challenges that statistical and spread-sheet approaches simply cannot handle, because it deals properly with accumulation and threshold effects, delays, interdependence and feedback. But the process often takes too long, costs too much, and demands too much time from busy people. It can also be hard to anticipate the likely benefits that will result from policy changes that eventually emerge. An "agile" approach focuses first on creating the simplest possible working, quantified model, then building out in incremental steps. The model is continually validated and continually delivers insight and value. The process is strikingly similar to agile development processes now widely used in the information-systems world, and has the added advantages of being more reliable and easier for young professionals to implement. In spite of a half-century of effort, formal methods for developing and implementing strategy (for all kinds of organisations and issues) remain inadequate - abstract, qualitative, subjective and unreliable. It is therefore little surprise that most such methods are neglected, leaving 'strategy' to be driven either by fads and fashions or by financial methods that reflect nothing of what is happening in the enterprise 'system'. This poor state of affairs persists because the strategy field is built on desperately weak theory, largely derived from statistical methods. These simply cannot handle real-world mechanisms - accumulation and threshold effects, delays, interdependence and feedback - that have long been acknowledged, but neglected. Every enterprise is, in reality, a designed system (whether consciously or otherwise), which is precisely what the principles of engineering exist to handle. This article explains in highly summarised form how these principles apply to the design and management of strategy, in terms that well-informed executives, analysts, students and consultants can readily understand and use. First of a trilogy of articles initially published in Business Strategy Review in 1999/2000. Includes improvements to the strategy dynamic method since that time, and updated examples with easy-to-use working, quantified models that readers can access. Updates to the additional articles in the series (The Dynamics of Rivalry and The Softer side of Strategy Dynamics) are in progress. First published in Business Strategy Review, 1999, Volume 10 Issue 3 pp 1-16. This second article in the series explores the three types of rivalry for customers and other assets. First published in Business Strategy Review, 1999, Volume 10 Issue 4 pp 41-54. The last article in this series looks at the impact of intangible issues. First published in Business Strategy Review, 2000, Volume 11 Issue 1 pp 45-58. Kim says: "I’ve fumed about the strategic errors that have got so many firms into the mess in which they now find themselves, but I guess you might like some idea how to get out of a hole? I recently gave a short session on one approach to this with a class of 50 senior execs, and was reminded about a project I did to help a company dig itself out of trouble last time round, after the 2001/02 debacle. In summary, the principle is that - like Starbucks [see blog post] - management rushes into over-expansion in good times, chasing more of those high-spending customers, launching more products and services to sell them, and adding capacity and staff to make it possible. In the process, they add quantity to these four resources, but don’t notice the falling quality - especially lower-spending customers, and products that don’t add sufficient truly incremental sales and margin. The end-result is a bloated business that just about stays in the air while market conditions are good. When things get tough though, the chickens come home - marginal customers and products collapse into loss-makers and you are left carrying the heavy staffing and capacity costs. How to dig out of the hole? Well - not by across the board cost-cuts and sackings [a friend told me of a star exec at HSBC fired at the cost of 18 months' salary, when his expertise will be desperately needed within 9 months!]. You need to ‘re-architect’ the business back to a healthy core that is both profitable and capable of re-energising its growth. That’s what the article explains [only in simple terms of course - there's much more detail to doing it in practice]. So it’s not a question of cutting back, so much as cutting out - gardeners amongst you might think in terms of ‘pruning’ - cutting out weak and diseased branches so the plant can put all its energy into its strongest limbs." Conference paper: Scenario Dynamics - anticipating industry futures. This paper summarises a panel session delivered in 2002 at the Strategic Management Society conference. Presentation: European CFOs Summit, 2001. Kim Warren builds the case for a strong understanding of key resources and the strategic architecture, taking a retail example. He concludes with Marks and Spencer as the case in point illustrating the effect of not doing so with a look at their problems in the late 1990's.